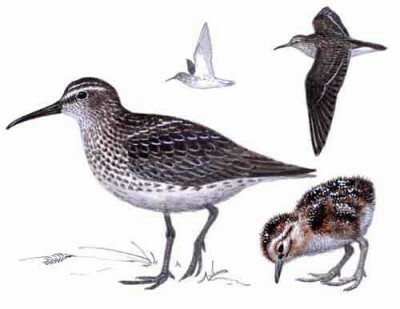 Slightly smaller than Dunlin, from which told in all plumages by longer bill which is broad-based with downward droop near tip, shorter yellowish grey legs and double supercilium, especially noticeable in breeding plumage. In breeding plumage rather dark upperparts with white ‘V’ on mantle and white line on scapulars and white underparts with noticeable dark-spotted and streaked breast and flanks. In winter, greyer and supercilia less obvious; then shape and length of bill, leg colour and, if present, dark area on carpals important for identification. Often has slow-moving and crouching feeding action. In rather erratic flight appears small, heavy fronted and, in breeding plumage, dark with thin wing-bar.